We all know it’s not enough to just take a good picture anymore. These days it’s all about standing out in other ways, and the one thing that has become more meaningful than ever is making sure your clients are satisfied 100% of the time. 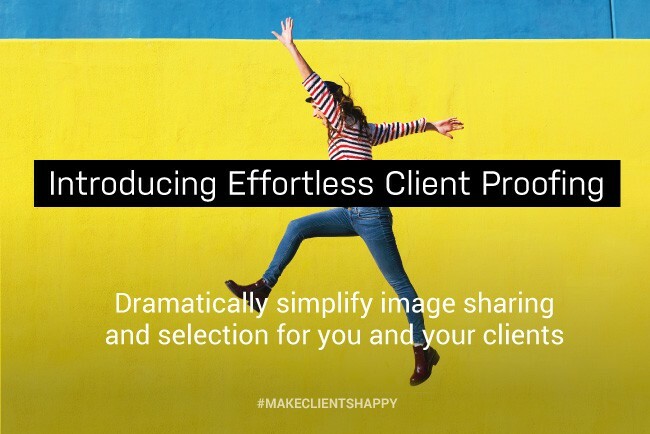 Automatically included with all Standard and Pro subscriptions, this new tool dramatically simplifies image sharing and selection, making your life — and your clients’ lives — just that much easier. How can a proofing tool make your life easier, you ask? Well, it takes the work out of what happens after the shoot: how you get files to your client so they can pick their favorites, how they let you know which ones they like, and how you deliver the final product. It streamlines your entire image selection workflow so you can say goodbye to endless email exchanges of screenshots and file names. And it eliminates the need for you to rely on other outside services to do the job. … and a whole lot more. Go ahead, check it out! So why pay for a separate service to allow clients to easily and quickly make their selects? With PhotoShelter, you can do that plus let them download and even make purchases — all from one place. Learn more about how the client proofing tool works in our Support Center, or join us for a webinar to get a live demo! Webinars will be held Thursday, April 30th at 5pm EDT and Friday, May 1st at 1pm EDT. Hope to see you there. Questions? Concerns? Feedback? Let us know at support@photoshelter.com. I love the new client proofing tool! My clients found it easy to use and the layout looks really good! Thank you!!! I really dig the way this looks and behaves but it would be more useful for my purposes if you use this to replace the old collections/galleries by adding the download, permissions and print ordering features. Thanks for sending along your thoughts! Passing this over to our Product Team straight away so they may consider restructuring things as you’ve suggested. As it stands right now, this new tool was designed to be a streamlined way for clients to pick their favorite images from a shoot, plain and simple. But we appreciate and encourage all feedback, and will definitely think about some of these additions for phase II! Is there a way for clients to rate the images in this new proofing gallery? I see my ratings but it would be useful for them to be able to rate images as well. I second this request and would also love to see the ability to brand our proofing pages. Glad you’re liking the new tool! I’m sending your note over to one of our Client Services associates now so they can get back to you about the multi-language support. You should be hearing from someone soon. I second Lionel’s question. It would be great to have the option to change the language. I am even willing to help with the translation into Dutch. Apart from that, It would be helpful if we could save invitation templates, similar to the gallery invites. I would not mind giving input, hopefully as a future customer! Very cool feature. Thanks for all the hard work! Did I ever tell you guys, that I love you? I am so glad that I stuck with you guys!! At first glance it looked great. Love the layout, filtering, easy selection of images… but then it fell short. 1. Sending the Invitation. We need to be able to customize the message and save templates as we do the gallery invitations we use now. That’s a must – too much wasted time revising each email otherwise. 2. As Eli mentions above, we need to allow clients to purchase images or products and download them instantly. The new system is ok if we’re billing clients and want to check their orders, but it’s a step backwards for existing clients that are familiar with purchasing their selection immediately and then downloading them (without the photographer needing to place them in a new gallery with download permission. 3. Along that same line… there’s no option for the photographer to add the selected images to an existing gallery… only a new one. 4. If a new gallery is created, there is no way to go to that gallery to affect downloads. I have to go to my archive to do this (afaik). Is the client supposed to finish their purchase then, after I’ve set up this new gallery with download permissions and pricing and then sent them the link and password to the new gallery? Seems like I’m doubling my efforts to accomplish the same thing I can do now with a gallery – only with a nicer presentation. 5. There’s no way for the client to view other galleries. I have several clients that I shoot for that have multiple shoots/galleries under their name. There’s no way to move from one to the other. OR.. am I missing the meaning behind this new proofing system? Thanks so much for sending all of this along — we greatly appreciate the feedback! I’m going to have our Product Team review all of this, but I will say that if your main goal is to allow clients to download or purchase images, and you do not need them to let you know which ones they like/need from a larger shoot first, you’re better off using a gallery proper. The purpose of the client proofing tool is to allow clients to select their favorite images so you may then retouch or edit before providing download access or presenting purchasing options, or just so you know which ones they like, and can give access to just those files. I certainly understand your points, though, and I thank you again for taking the time to put this together for us! If you think of anything else you’d like to add, please feel free to send our Product Team a note directly at feedback@photoshelter.com. After using this new feature a bit more have to agree with Mike that being able to edit the invite template would be very useful as would the ability of clients to add notes to their favourites rather them having to do this in a separate email or phone call. EXCELLENT!!! Now I don’t have to keep looking at Shootproof and wishing Photoshelter had the same. Just when I was starting to waver, you managed to keep me signed on. THANK YOU! Can you disable the link once clients have finished? What would be great is if you could then link those favourites back into Lightroom and have those images flagged..
A great solution to this would be to integrate the proofing system with the PS-LR publish service. That way the selects would get synced back to LR with out much need for user intervention. And once we made edits, those would automatically get synced back to the PS gallery for download. Either way, I have been asking for a real proofing system with PS since 2009. I have since made a very robust system using LR plugins and my own web coding. Though, making this work with the publish service may sway me to stop using my own system. Paul, There isn’t a direct way to do this, but if you watch the video at 3:59, you can see how to easily accommodate this type of workflow. Yep, I saw that. And that is basically how my self made system works. Thanks for the response, Allen! Great Proofing tool but I second all the suggestions as far as proofing, links, download+sync to LR. The steps you’ve outlined, Rachel, seriously clamp down on time. Please explain – What do you do when you have 23, 755 images from 8 Editorials that are being edited and culled at the same time with deadlines that were day before yesterday? Another feature request I have asked for over and over again is the ability to create a PDF from full galleries from which a client can pick/choose to suit the assignment on hand – Create custom PDF portfolios. It is industry standard and the same as a leave behind. Yeah – I am so excited by this new tool. Cannot wait to give it a test drive and share with my clients as it looks so much more user friendly than the lightbox process … it was on my photoshelter wish list for some time – another item crossed off the list. I am confused – am I to send 2 invites to a client? – 1 invite that directs clients to a gallery with downloading & products ordering, and a second invite to a gallery where they can sort & filter images? Please tell me there is a way to combine these features? Also – I have a custom sort in my original gallery, the new version does not mirror this custom sort, the images appear to be in ‘date date’ order. The custom sort is very important as I use the gallery to give clients their first look at wedding images, and we like the gallery to tell a story like an album, not like a proof book. The new version looks SO MUCH BETTER, will make my client experience much better, love it… if these few items can be tweaked. Many thanks. I’m sorry you’re confused! Let’s see if I can clarify a bit. If you need for clients to select favorites before you provide download access or purchasing options, you would use the client proofing tool first. Once you receive your clients’ selections, you could then make any necessary edits, and/or just give access to those specific files. If proofing is not a necessity for you, I would recommend just sending the gallery outright. Hope that makes sense, but I’m going to ask a member of our Client Services team to follow up in case you have any further questions! Also you are correct about the custom sort order, and I’ll bring that up with our Product Team directly. I too noticed the sort problem. Looks like it was a bug that has been fixed though. Yep — thanks, John! We just corrected that, so everyone should see the proper custom sorts now. I’m very happy about this! It is exactly the updated functionality I was hoping for. Just last week I was emailing the support team requesting valuable features such as these. Thank you PS for delivering! Just want to thank everyone for the kind words! We’re really excited about this tool, and we’re so glad to hear you are, too. Please feel free to continue sending your thoughts and feedback along, either here, or at feedback@photoshelter.com. We’d also love to hear more about how everyone is using the client proofing tool over time — has it helped to simplify your workflow, has it made the process easier for your clients, etc. Shoot me an email directly at rachel@photoshelter.com if there’s anything you’d like to share! Rachel I was about to suggest an update that would’ve been almost as good as what you guys have created here. Well done, this is awesome. very happy with this tool…. good job…. Hi, I just tried this and there’s no menu appearing in the upper right. That menu will only appear if a client has picked their favorites and you have clicked on their name/selections in the left-hand panel. Could that be why it isn’t showing up for you? If not, definitely reach out to our Client Services team so they can do some investigating! You can send them a note at support@photoshelter.com. I’ve realised what was wrong, I was testing it by sending a link to my alternative email so I could see how clients view it but I was still logged in to my photo shelter account so it wasn’t displaying the fave buttons or that menu. This feature is just what I have been wanting. I would like to give the client the ability to make notes on there favorites. I would manly use this for clients to approve the retouching and cropping of photos they have already chosen and purchased. Nice new feature making it much easier for clients to select final images from larger gallery. One thing to add to the client invite function is a tick box to send email to myself so I can have a email copy and chain of replies from original invite. I am adding myself as a invitee but I think a tick box would be cleaner and simpler when sending out invites. Good work. ok so having played with this for a few days with clients heres our thoughts. It looks much better and as a browser of images its much easier to navigate. Clients like being able to easily pull images together they like but then they want to download them for immediate use not wait until they are put into another gallery to download, it slows things up for them. I know for me the photographer it is meant to speed things up but if you show a client more than the best picks they want them all high res and retouched anyway. Ideally what we would like to see is Beam, Photoshelter and now ‘proofing’ all being integrated into one resource, So being able to give clients the ability to view and navigate there images from all there shoots, mark/comment on any that need retouching and download them all from he same web page. Its a great addition but we’d like to see it go much further. I’m happy to see a new alternate to having clients add images to lightboxes. That was not my favorite way to have images selected. The option to download the selections is awesome rather than having clients write it down. This really speeds up things for both of us. This is nice – but it absolutely NEEDS to have download and print order options in the same gallery. Having to send my clients multiple galleries is very confusing for them. Also – you seem to have lost the features from lightbox – where the clients (and client’s friends or agents) can comment on the images. That was a very useful feature. Also – the lightbox features a button called “inquire about this image” – which my clients use to give me specific feedback on their retouching requests (like: “please straighten my collar, and erase fly away hairs on this image” etc). Those features are essential to clear and easy client communication. As it stands now, I cannot use this new proofing system. I do have one bit of feedback: often a client team wants to see their gallery of favorites, make their team gallery + send that to me before I’m seeing each team members’ favorites + making that gallery for them. Is there a way for them to collaborate + merge their favorite galleries on the Client side + then send that to me? Thank you for your stellar work! Brilliant but needs a bit more work – When I hit review favourites it still shows all the unfavourited ones. Kinds of defeats the point in reviewing them. Very much like the new proofing tool. Already had a client make her selects using it – so that’s great! I’m already logged into PhotoShelter doing other things and want to see what the client has selected… no way to get “there” but going back through the email link? What am I missing? Also, the up arrow button in the upper right corner is a bit strange. The download function just spits out a text dump of filenames without any line breaks or carriage returns. So, that’s a bit odd. And the email function sends an email to me, from client address as if the client sent it.. odd. Overall it’s a nice addition and one of these days I get my act together and see what else I’m not fully using properly. If you’re logged into your account and want to see what your client has selected, you can just head to your Image Browser, click on the gallery in question, and then access the Client Proofing section in the right pane. There you will find the “view favorites” button, so you don’t have to go searching for the notification email. Will pass all of your other feedback along. Thanks very much! This gets so close to the ideal proofing solution for me, but is still missing one feature that would make things so much easier: NOT requiring a login for the client to pick their favorites. I don’t do a lot of repeat business due to the nature of my clients (small businesses referred by a large media company), so all I really need is a way to put up a gallery of 20 or so shots and have them flag the shots they want to purchase. Having to create a login to do this is just an extra bit of friction that I (and my clients) don’t really need. I don’t even need the “select and download from a single gallery” that so many are requesting, just the ability for anyone to get to a gallery from a link and pick favorites without needing a login. It would be great if you could add a validation feature based on a photo selection limit — we set the max number of photos that can be selected (based on the license the client has been quoted), and the client can only pick that many, any more and they get a warning/dialogue that appears: maybe with the option to request additional licenses. Also be sure to check out the “coming soon” section for the proofing tool so you can see what else we have in store. As always, our Client Services team is here if you have any questions: support@photoshelter.com. After using the new proofing gallery a little more, I can appreciate it’s usefulness. What would be a nice ‘feature’ is a generic, short video aimed at the client to show them how to login, create an account, select, favourite and send the images to the photographer. If this was added to the invitation email, it would explain a lot to the new customer that isn’t familiar with the process. Looks fantastic and it would be brilliant to deliver my latest shoot to clients this way. But for me to use it it needs a few features already mentioned here but I thought I should add some weight to. 1 – Access without logging in. Even if I make my clients an account its still a bit of a faff for them. 2- Being able to download as batch or individually. I guess making it behave like a gallery that looks way cooler would suit me! At first glance this looks great, but requiring each and every client who wants to view a proof to create a Photoshelter account is an immediate deal breaker for me. I don’t want to put my clients through that. Plus, it kind of looks like a backdoor way for you to recruit more customers, which is a little off-putting to me. I agree on the account creation aspect (I made similar comment already) , but mostly I just wanted to say you’ve got great name. And right back at you 🙂 And you’re a Barton, not Barthalomew, which is very rare. Right on , Bro. 1. You don’t have to use a email/password to grant your customers access. You can set up a password instead in the Visibility & Access panel. 2. For any scenario where a company was offering secure login with an email/password combination, they would have to create some sort of account on their system. This would be true even if they use “federated” login (e.g. Your Facebook or Twitter login). 3. In the 10 years that we have operated, we have NEVER contacted people who have signed up as our customers’ customers. Other than the qualms that other people have listed, I like the design, and wish a similar display of photos could be carried over to the other regular proof/non website galleries (the one where a lightbox can be created): at least the adaptive/fluid sizing of the photos. That or the other galleries are ditched and some kind of combination of both systems are introduced. It is a bit of a disjointed experience to me to have two different proofing gallery concepts. Design-wise I do find that my logo appears comically large at the top of the new proofing gallery and ideally it wouldn’t be so large freeing up screen real-estate for the photos themselves. Also the images adaptively resize a lot before the logo starts to get smaller. Option to hide the filters side bar on launch, like we can do with the sidebar for the Beam websites. OK, maybe I’m missing something here. It appears that the images show up in a random order and that there’s no way to have them display by filename or date taken. If that’s true then this proofing tool is worthless to me, as I need for images to be grouped so that clients can make choices between similar images. For instance, if there’s 10 images of a similar pose and the client wants to pick the top one or two to share with others, how are they going to be able to compare them if they’re not all next to each other? Hi Leon, the proofing tool uses the same sort that you designate in the gallery within the photographer area. For a wedding or event client, I have 2 send them 2 links to their photos? One so they can mark some favorites and another so they can buy prints, downloads, etc? Forgive me, but what am I missing in this model? Do you require clients to let you know which images they liked best from a shoot before you give them access to download or buy? Or so you can perform edits on only those files before delivery? If not, this tool probably wouldn’t be very useful for you. If you typically allow clients to download or purchase any images they want from the shoot, and not make selects first, sharing a gallery proper would be your best bet. Re: the general use case of having to share two links to two different “instances” of your site, I would say our goal is to build tools for specific purposes, and we believe those tools fulfill their purposes better than a single tool that tries to do everything all at once. If you were to use both the client proofing tool for image selection, and then also a gallery for delivery later, the key to unifying the experience would rely heavily on branding, and also communication with your client. Hope this helps to clarify a bit! Happy to chat further if you’d like. Feel free to email me directly at rachel@photoshelter.com. Sorry Rachel, but I still dont get it. I really don’t. What about branding? Im confused. If I edit a shoot for a non-commercial client, say a wedding, yeah, I want them to pick favorites so I can make a book. But they should also be able to use the same gallery to order prints. I have no idea why you would want to send this to a wedding client, have them pick their Favorites, then upload the results to your client gallery area so they can order prints, etc. Especially considering that your client gallery design is completely different looking than the client proofing area. For such and experienced company, I have no clue why any wedding, portrait, event photographer would use you. It seems to me, from a branding standpoint, you guys are all over the place. I men, between Beam for portfolio, the outdated client gallery site for ordering prints, and now your client proofing site, you have 3 completely different designs. So sorry for the delay, and for your frustration here. Why don’t you get in touch with us at marketing@photoshelter.com and we’d be happy to address the issues directly and in more detail. Is there still no way for a client to make selections without signing up for a Photoshelter account? Kind of a deal breaker for me. Also, what about commenting? Another potential deal breaker. Not what I was looking for. I am a long time user of a competitor of yours and am always checking back to see what you’re up to and find myself a little disappointed that you haven’t updated the look and functionality of the client gallery system. I don’t see why it can’t all be in the same gallery structure. For event, portraits, I don’t see how your system could work. Having to send them 2 links is terribly confusing esp. when they’re completely different looking. I think a lot of people are waiting to move over, myself included, but things aren’t there yet, unfortunately. The user experience seems really clunky, with the account creation, logins, different galleries structures, etc. It’s close, but still needs work! I will continue to check back! Thanks. It’s too expensive to be this clunky. Thank you for removing that ‘sign up for a free account’ roadblock in the proofing gallery. Previously I had to send two e-mails to the client – the proofing gallery mail, followed by a mail containing the ordinary gallery address, accompanied by an explanation that if you don’t want to sign up for an account please use the second address. Not a very organised image for a photographer 😉 I shoot RAW and give the client the chance to choose the pictures before editing, so the proofing gallery makes the process run like clockwork. A recent comment on promotional stills from a busy TV series director in the middle of an intense two week shoot – “I made the selection through the website – it was super easy” ( website = proofing gallery ) Great feature! Keep up the good work. Looks like it was just wishful thinking – I must have been logged into photoshelter when I tested the client proofing e-mail by sending it to myself as well as the client. This really is a problem guys !! It’s total useless if my clients are not interested in setting up an account with photoshelter and having to remember the login details every time I send them an invite – it’s just another hassle in their busy schedule. Pleeeeease – open up the client proofing – surely you can get enough new members some other way! I just tried this sytem, sent myself an e-mail, and I must be missing something. When I went to the proofing gallery, there was no way to select an image. No “+” sign appeared in the upper right hand corner. I tried this on several different galleries, all set to Everyone permissions. It sounds like the system was recognizing you as the photographer, but to be totally sure, I’m going to have a member of our Client Services team reach out to help. Look out for an email from us soon! Do you still need to create a PhotoShelter account for every client that wants to use this tool? If I can create a gallery and just give a client a password to download the photos, why can’t I just give the client a password to select photos in this new proofing tool? There’s no way I’m going to tell everyone of my clients they need to create a PhotoShelter account in order to work with me. That’s kind of ridiculous. Because this tool allows multiple recipients to make selections, an account must be created to save those selections. It is actually quite simple on the part of the client or viewer because their email address should already be saved if you invited them through PhotoShelter, and it will just ask them to create a password. If you have further questions about this, don’t hesitate to get in touch with our support team at support@photoshelter.com. Am just looking into this new tool… loads of good suggestions for improvements already. One question I have, or improvement I would like to see is the addition of a check box that would send me a copy of the email invitation that was sent to the client (this feature exists w/ lightboxes,) I find the email copied to me to be a very convenient way of keeping track of which client I have sent proofs to. Glad to hear you’ve discovered this tool! That is a great suggestion and something that our products team is looking into in addition to having the ability to create email templates. I’ll definitely reiterate the request for you. Love the feature and working to add it to my workflow. So far my clients seems to accept that I make them sign up. A few times now clients have complaint, that they can’t see the selection made by their colleagues. If I invite a group at a corporation to proof images, it would make sense that they were able to see each other’s selections. Wait…. I can’t invite a group to proof the images? I need to find each contact at prepair a message to everyone? When is a commenting feature going to be implemented? This seems so basic and a critical professional feature. Any idea why my photos are coming displaying with such low quality out of the proofing galleries? They look terrible! I get much better quality just putting them in a dropbox gallery, which costs me a lot less. I can send some screenshots if anyone wants to follow this up: I’m uploading high resolution images — the same as for my website where they appear sharp. Any chance there will be a response to my comment from many months ago about making the logo on the proof gallery smaller and having custom text as well: not very difficult things to implement. And auto hiding the filter menu? I’m not sure exactly what the issue is, but I’ve passed this comment along to our support team, and someone should be in touch with you shortly to help get this issue resolved. Additionally, I’ll re-iterate your feature requests to one of our product managers! I agree with all the messages above that ask for a unified interface to clients. The client proofing UI is great, but why didn’t you build in the download functionality, e-mail templating, etc. In the comments above, you have promised to pass these suggestions to your develop team. Do you have a roadmap for when it will happen? why i don’t see the option “Client Proofing” ?